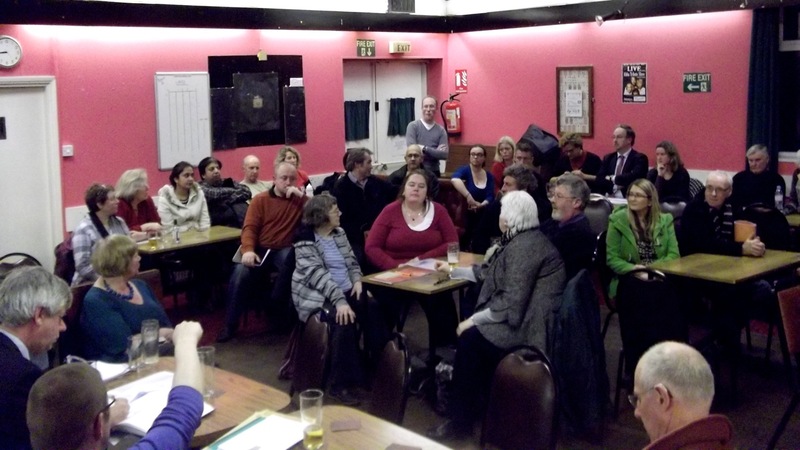 Eighty-two people crammed into Charlton Liberal Club on Monday night to discuss plans for Charlton riverside. Antony Rifkin from Allies and Morrison Urban Practitioners, who drew up this planning document, fielded question from the public for nearly two hours. The event was organised by the Charlton Riverside Action Group with the support of the Charlton Society. We were slightly taken aback with the impressive turnout but this enthusiasm and energy is certainly very positive. It must have shown the developers and the council how much residents care about this area of Charlton. Charlton’s resident celebrity, Glenn Tilbrook, was also in attendance. He revealed concerns that his own music studio could be “swept away” as land is re-designated for housing. He said that segmenting different areas isn’t necessarily the best way forward and Charlton riverside should be integrated with small businesses finding a place amongst family homes and green space. There were calls to consult local workers more and questions asked about the safeguarding of our wharfs and the Angerstein Railway Line. Many had the opinion that a new residential area should not be similar to the Woolwich Arsenal or Greenwich Millenium Village developments. People were sceptical about this master-plan. There were concerns about its worth and how vague and badly researched it looked. However, there seemed to be universal agreement that Charlton riverside needs redevelopment and that having a strategy for the area will ensure changes will not be piecemeal and will not happen by accident. The next step is yours. The consultation officially ends on Friday 9th March at 9.00am, however, Mike Howes at Greenwich Council mentioned that they would be taking responses up until next Tuesday. There’s no need to fill out a form online you can simply email your thoughts directly to masterplans@greenwich.gov.uk. The combined response from CRAG and the Charlton Society can be found here but we really need as many people as possible to send in their views. Don’t feel obliged to write as much as we have! Thanks very much for coming and we hope to see you at future meetings. Many thanks for the massive amount work people have put into this. I’m sorry I couldn’t attend the meeting, but broadly I agree with the bulk of your points/objections etc. FWIW I’ve sent my own response to the council. The lack of high profile consultation on this high profile project is, frankly, astonishing. Were it not for sites like this I would have been blissfully ignorant of what was happening. Thanks again. I’m saddened by the complete misquotation of what I actually said at the meeting. My first points related to how this Masterplan totally ignored the London Plan in which employment land loss has been seriously considered. One matter that I didn’t then mention is that, because this area is designated as a Strategic Industrial Location, the final say lies with the Mayor of London. The Safeguarded Wharf Review, that I also mentioned, has an interesting appendix which lists all of London’s safeguarded wharves. One, Tunnel Wharf, appears to lie within Peninsular West, another Greenwich plan area. The factory there has been demolished in preparation for residential development; the Mayor of London has objected. It is not sensible to ignore both national and regional planning guidance when producing development plans, but that is what Greenwich has done. Later in the week, I attended another meeting, this one with one of Greenwich’s planners and with Richard Lee representing the Just Space Network, but more about that in a minute. The lady from planning, when questioned about the advisability of developing area plans before the Core Strategy had been agreed, admitted that the Core Strategy would have to be amended again to take in the new plans. In other words, plans are directing strategy. That will sound good at the Strategy’s examination in public, later this year! I have received copies of the objections raised by the Port of London Authority, a statutory body with planning responsibilities relating to the river and to wharves and other landward activities. These comprehensively list most of the many planning breaches within the Charlton and Peninsular West plans. Cory Environmental and Hanson have sent me their objections, too, and these make a few more observations that the PLA, acting in a hurry, had missed. Of course we need more housing but not at the cost of employment loss, specially at a time of high and rising unemployment. Indeed, the London Plan requires that any development of Woolwich, Charlton Riverside and Peninsular West produce, between them, 13,000 new jobs – not a reduction. My proposal is for a new ‘vision’ based on increasing employment and that this be based, in part at least, on the transport opportunities offered by the Thames. Further that cleantech recycling be another base. Cory is already operating from the Charlton Bargeworks so there is a local source of raw materials, plastics, perhaps. Back to Just Space: I have been a member of the Just Space Network and, coincidentally, when I received notice of the second meeting, I was writing to another member, who lectures at the Bartlett School at UCL. The outcome of all that is that I have an offer of a team of postgrad students who will put together an alternative plan based on industrial development. I have also asked other old UCL friends, at the Chorley Institute, to help map existing business, both to show the important nature of a wide variety of goods and services – as well as employment – and to give a base for an industrial development strategy. Just a simple example of what could be achieved, in the meeting with a Greenwich planner I commented on the absence of evidence of Sustainable Drainage Systems (SUDS) in recent Greenwich planning and developments. I noted that this could be remedied in new development, including housing. Rainwater harvesting would be very useful but it’s all still fairly new in the UK. Could we recycle plastics into rainwater harvesting systems, built in Charlton? Hi Roy. Sorry I didn’t get your main points across, although you’ve now remedied that. Decided against getting too bogged down with planning talk for the purposes of this website – hope you understand. Thanks, Matt, but planning matters are at the essence of these flawed plans. Thanks to everyone who came along and, to those who weren’t able to get there, I hope you were able to email your comments to the Council or migrate their site to make comments on line. It is not right that this was rushed through but at least we showed that we do care about our local area and we do want to be involved in its future planning. The picture above only covers half the room! It was a difficult room to take a picture in – the other half of the room was equally full. A lively discussion and quite a challenge to Chair it (which I was trying to do). Thanks again – and let’s now see what the Council do with our comments. We will organise another meeting soon – please pass on the existence of CRAG to anyone you know, we are just a group of local residents that are passionate about our local area. The CRAG email is charltoncrag(at)gmail.com – please substitute @ for (at), and thanks to Matt for setting this up. The CRAG response is a clearly impressive alternative, and far better researched than the masterplan document, despite the short timescale. I am very keen on the farmers’ market and opening up wharf space for local use. I do think it leaves aome things to be said about distrubution and recycling though and have used the extended deadline to put my response together, particularly on these issues. I’ll post it all here as I don’t have a blog. Hope that’s ok. I note with positivity the Charlton Riverside Action Group’s response, particularly ideas for integrating mixed use development within the area. It is certainly the case that Charlton’s industrial areas have grown ‘organically’ both to serve the needs of local people, and to make broader productive use of affordable space, particularly for small and medium scale industry. ‘If it works, don’t fix it’ is a useful maxim here. The Cory Barge works is well known, but there are also other iconic firms here working long term to develop positive initiatives, such as the apprentice school attached to the Stone Foundry, and a number of food and other distribution companies like Lea Valley Foods, whose employees are mostly local people who have benefitted from skills training within a working framework requiring no state subsidy. This has to be a sign that their businesses are sustainable. Thinking about smart industry is a complex task, and requires proper study of our economic base, in conjunction with awareness of various newer fields of industry. (For example, ivp, who provide monitored security services, are certainly developing within this context.) The masterplan presents a picture of vacant industrial space across Greenwich, but implies that most of it is in Charlton. It isn’t. I am concerned that Allies and Morrisons’ priorities are not informed by a study of industry, but rather by an image of what is desirable to people like themselves. The masterplan reads like a glorified estate agents brochure. This cannot be sufficient in this post-property-boom era. Before embarking on a redevelopment plan, strategic objectives need to be identified. Making best use of riverside locations is a laudable aim, yet the nature of this best use needs to be widely informed. Not one of the dozens of local firms I have made contact with since the masterplan’s publication had been consulted beforehand. This is somewhat irresponsible. I also read after the consultation last year into UDP options that there was an alternative strategy suggested that included more industry within a mixed context. The reason I was given by local representatives for this not being positively embraced was the fear of development plans prioritising industry being over-ruled in a wider strategic context. In fact the opposite seems to be a probability. The presence of so many small and medium scale food, furniture, stationery and other distribution firms is also a jewel in the crown for Charlton and for Greenwich. Sainsbury’s seem to be taking all the public notice in this field, with their relatively huge number of lorry movements set to increase. Large supermarkets have the ear of local planners, where small businesses seem to have been ignored. This imbalance is a miserable inditement of the direction local politics seems to be taking, and must be redressed. Neither has a long-term strategic view been proposed so far to the high-value of recycling priorities in the next decades. One of the reasons why British industry is at a disadvantage to China, for example, is that clean production is not regulated to such an extent there, allowing rapid expansion into new technology without considering the environmental implications. Global warming and climate change, though controvertial, must be urgent considerations. Non-ferrous metal prices are rapidly increasing however – of this there can be NO DOUBT. Wherever recycling of precious resources takes place it is vital for the future of the planet. Issues of local pollution here are largely irrelevant – the impact of wasting recycling opportunities is global as well as national. The fact that there are a large number of scrap metal and car breaking firms in the area has been presented as a negative factor, and used to get local environmentalists to support the general redesignation of Charlton’s industrial areas. This is a huge mis-representation. Where better to establish recycling than near London’s arterial river with deep water working wharves that will enable a long-term plan to use clean river transport to move large amounts of material from a relatively central location to places where it can be re-processed on a large scale? The Cory environmental reprocessing plant is a short way down the river. It is obvious to anyone with an ounce of common sense that to sacrifice the potential to develop and expand sustainable river transport networks on small, medium and large scales to favour the out-dated dreams of residential property developers is deeply foolish short-termism. Can Greenwich seriously be proposing this? Council leaders, if they succeed in this nonsense, will go down in history as profiteers of destruction. I would be sorry for our great borough to have to live with such a legacy. Thanks to both Ashleigh and Roy for these extra posts. I did try to include a flavour of the employment and use of river for industry points in my personal response too. Sounds like we should have a meeting quite soon to keep up the pressure – I’d like us to join forces to put the pressure on the Council to do better – and to ensure that these points are really addressed. We do have developers already putting in planning applications so it would be a shame to see the positive points in both the plan and our amendments to it ignored. What is the appetite for a meeting in April/May from the readers of this Blog? Some useful responses to the Charlton Riverside plan are now up on the Greenwich website. One from the Mayor of London’s office does clearly refer Greenwich back to the London Plan. Happy to meet and discuss an alternative vision. land review to assess this fully.